Dimensions (HxWxD): 1.5" x 3" x 3"
We have finally received some new & fabulous crystal bowls from our supplier in India. 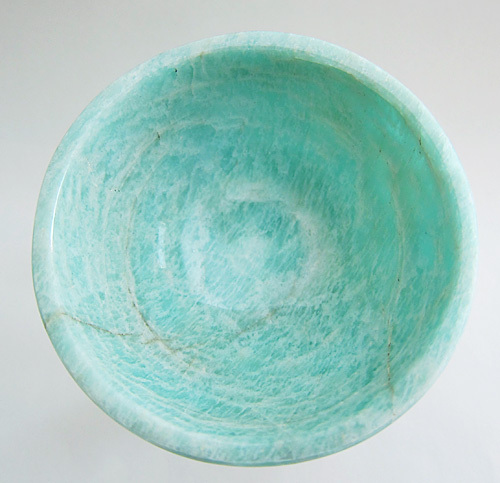 These Amazonite bowls are particularly pretty & we're so pleased with the way they turned out. Each one averages 3" in diameter, and weighs 39 grams or approximately 1/4 pound. Each bowl may vary very slightly in appearance from the photos here. However, you will find that these photos quite adequately portray the beauty & color of these lovelies! 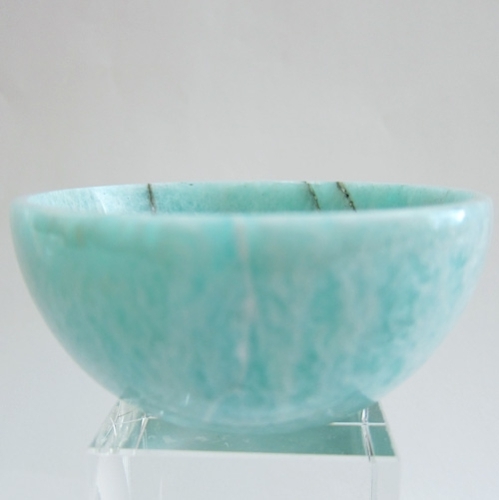 Amazonite is a gemstone variety of feldspar and so shares in those qualities as well. Feldspar comprises a large group of silicate minerals containing calcium, potassium or sodium. Amazonite varies in color from yellow-green to blue-green and also often contains whitish streaks of color. Amazonite is a mineral which is said to be soothing to the emotional body, soothing the nerves by eliminating aggravation and dispelling negative energies. It is soothing to all chakras, especially the heart and throat, and because of it's blue-green color it is very helpful in communications of all kinds. Because this stone is very balancing to the etheric, astral and physical bodies, it is a wonderful stone for healing, for balancing male and female energies, and can be used as a preventive stone of protection. Because of it's bluish-green coloration, amazonite is said to energize and activate the throat and heart chakras, which are assigned the colors blue and green in the Western chakra system. Working with the blue green of this lovely stone will also facilitate communication through the powerful lens of the compassionate heart. Note: Average weight is 3.9 oz., or 39 grams, approximately 1/4 pound. Average dimensions listed above. Each piece is guaranteed to be beautiful & to meet with your complete satisfaction!